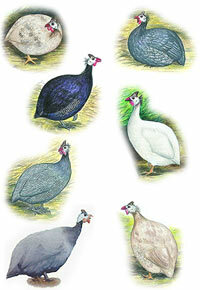 If you are interested in guineas but aren’t sure which variety you prefer, this assortment will be just the thing for you. The varieties will be our choice but we will guarantee you at least three different kinds from this group: Pearl, White, Lavender, Purple, Coral Blue, Buff, Buff Dundotte, Porcelain, Opaline, Slate, Chocolate, Powder Blue, and Brown. This will be an assortment that will really create an interest from anyone visiting your homestead. Can you mix Guinea with chickens to equal 30? or do you have to buy 30 guinea? Our guineas and chickens are hatched and sent from separate locations for bio security purposes, therefore they cannot be shipped together. Straight run means unsexed, "as hatched". We do not know if they are males or females. can you ship Guineas to Hawaii? Sorry, we are not able to ship any type of fowl to Hawaii. Only the baby chicks. As I reside in Central California and the earliest shipping date available is in July when temps can be in high 90s and low 100s is shipping advisable ? The chicks do well during transit when it's warm. They are hatching in the incubators at 99-100 degrees. how do you tell a girl guinea baby chick from a boy? We do not offer the guinea keets as sexed chicks. They are available in straight run only, "as hatched" or unsexed. When older than 8 weeks old, a female guinea makes a two syllable sound like "good luck" or "buck wheat". Male guineas make a one syllable sound. Our minimum guinea order is 30. Guineas vary in price depending on the breed and amounts you are wanting of each kind. Is thirty (30) the least amount of Guineas you can order at one time? Yes, our minimum for shipping guinea keets is 30. The shipping minimum is necessary for the birds own safety and body warmth during transit.